Last year, I came across the detective novels of "Nicholas Brady," a penname of John V. Turner, which was used for a short-lived series about a clerical detective-character, Rev. Ebenezer Buckle, who only has four appearances to his name with The Fair Murder (1933) as a high point in the series – a memorable detective story with a plot as dark as a nightmare. Rev. Buckle shined as a multi-faceted character in Ebenezer Investigates (1934) and Week-end Murder (1934) slightly underwhelmed as a detective novel. So, all things considered, a criminally underrated series and, sadly, had only one of them left to read. 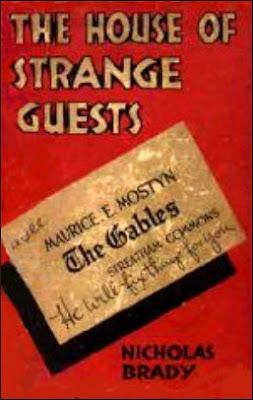 The House of Strange Guests (1932) marked the debut of Rev. Buckle and was introduced to the reader under very irregular circumstances, but this is par for the course in a series with a tendency for the bizarre. Somehow this one turned out to be most orthodox of the four. The story opens with a telephone call from Butler of The Gables to the Streatham Police Station to report that he has found his master, Maurice Mostyn, dead in his bath and it appears as if he had turned on the gas under the geyser, but Divisional Detective-Inspector Hallows is confronted with evidence that precludes the possibility of suicide – such as the lack of the tell-tale signs of gas poisoning and the peculiar sitting position of the body. However, these are relatively normal aspects compared to what Hallows learns from the butler, Summers, about the victim. Maurice Mostyn was a bachelor of apparently independent means, but Summers never knew "a place where there were was so much entertaining." There have been guests at The Gables nearly every week for the past ten years. On the evening of his death, Mostyn had been entertaining five guests. There is, however, a complication. Summers confides in Hallows that he has no idea who the guests really are, because he has often overheard his master address his guests by different names than the ones they gave to him. What follows is a difficult series of interviews between Hallows and the cast of characters populating the house. Andrew Posten, Sonia Wether, Lois Welling, Alleyne Kimball and Raymond Simms are "an odd mixture" of house guests and their response to the death of their host is a spectrum of emotions, which range from glee to a mental breakdown, but Simms proved to be the oddest one of the bunch – aloofly chatting to Hallows about Pliny the Younger, Daniel Webster and William Shakespeare. Simms is no one less than Rev. Ebenezer Buckle and he summons his brother, Assistant Commissioner Stanley Buckle, to explain his position as an amateur detective. You can read that chapter as an origin story. Rev. Buckle is "the rector of a tiny parish in Hampshire," a place called Dowerby, which only has a population of about two-hundred souls and there are only services on Sunday. So he has "a tremendous amount of spare time" that he filled with botany and criminology. Buckle began with studying criminal psychology, records and the criminal code, but eventually started to attend the Assize Courts and accosted prisoners as they left the goal. The last step in the process was pestering his brother and, one day, gave him his opinion about the Vallot murder, which proved to be correct and has since given Scotland Yard "considerable assistance" in a number of investigations – such as the Matson case, the Robbins case and the Wain murder. Sadly, these are all unrecorded cases. John Norris of Pretty Sinister Books introduced me to this series and he accurately described Buckle as "a lively amateur sleuth" cut from the same cloth as John Dickson Carr's Dr. Gideon Fell. I couldn't agree more with this observation. Just like Dr. Fell, Buckle is a wool-gatherer who prefers "to theorize first and prove afterwards" and pepper his speech with enigmatic remarks that appear to make no sense whatsoever. A good example of this when Hallows called in the assistance of Bonny Curley, a safe-breaker known as "The Human Key," who's tasked with cracking a safe with a double number-and letter combination lock, but when the door swings open, the safe turns out to be entirely empty – which baffled the safe-breaker. Why waste time on opening an empty safe? Buckle enigmatically says that their time would have been wasted if the safe had actually contained something. Buckle is at his most Fell-like in the final chapter, entitled "A Study of Clues," in which he not only goes over all of the clues and red herrings, but effectively demonstrates why the murderer was the only person in the house who could have killed Mostyn. 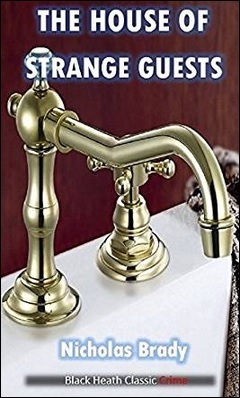 A good piece of reasoning involves the position of the body and the water-taps of the bath. So this alone makes The House of Strange Guests a must read for fans of the pure detective story with logical reasoning. However, there's one aspect of the solution that will rub some readers the wrong way. Honestly, I groaned when my deductions were proven to be correct and Brady likely knew this part of the plot was hackneyed, even in the early 1930s, but (IMO) he somehow managed to pull it off in the end without ruining the whole book. A wire-walking act as daring and risky as the stunt Carr pulled with the solution of The Plague Court Murders (1934), but Brady and Carr miraculously made them work when they really shouldn't have. The true mark of craftsmanship! Brady really did his best to make this aspect as acceptable as possible and, considering the overall plot, I'm more than willing to give it to him. 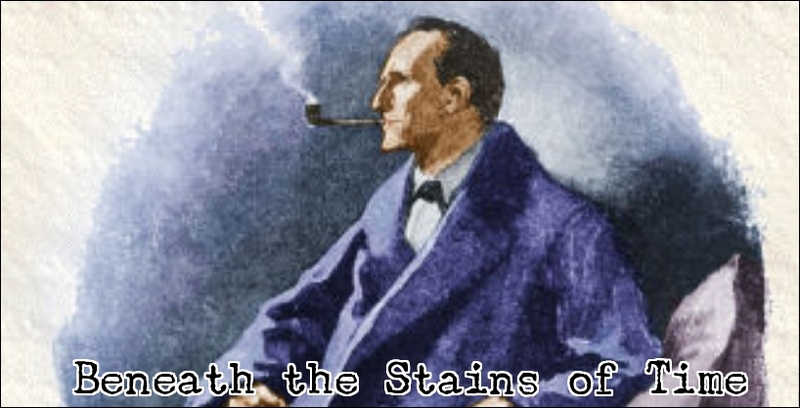 So, all in all, The House of Strange Guest is a fascinating, old-fashioned, but lively told, detective story with splendid clueing and a daring solution that could have potentially spoiled the entire book. That it worked makes this the second best entry in this too short a series. Although it has to share that spot with Ebenezer Investigates. Well, this closes the chapter of Ebenezer Buckle on this blog, but you have not seen the last of Brady/Turner. Black Heath has reissued the extremely rare Coupons for Death (1944), a World War II black market thriller, as well as a handful of mystery novels published under his own name. Granted, Amos Petrie is not as good a series-character as Rev. Buckle, but Death Must Have Laughed (1932) was a perfectly passable detective story. Amos Petrie's Puzzle (1933), Death Joins the Party (1935) and Homicide Haven (1935) sound like potentially good detective novels. So I'll be taking a stab at some of them in the future. I'm being tempted by the idea of a kindle (much as I detest the idea). If I succumb to the temptation I my have to check out Nicholas Brady. I used to dislike the idea of an e-reader, but it has proven its use and Brady alone was worth the plunge. Granted, it has some drawbacks. Like not owning a physical copy, but then again, some of the ebooks I have read are very hard to get in paper. If you succumb to temptation, The House of Strange Guests is a good introduction to Reverend Buckle, but The Fair Murder and Ebenezer Investigates are the ones I would recommend. Particularly The Fair Murder. You're unlikely to ever forget it.